Is a landlord required by law to have a property manager and/or statutory agent? 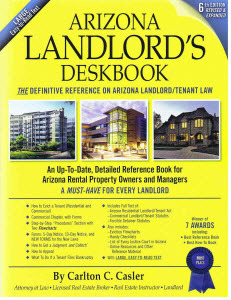 Neither in-state nor out-of-state landlords (i.e., landlord who own residential rental property in Arizona, but who live outside of Arizona) are required to have an in-state property manager. Both the in-state landlord and the out-of-state manager may manage their own rental property. Whether or not that is a good idea, is a different question, but the law does not require a property manager. However, an out-of-state landlord MUST have an in-state statutory agent. To be clear, a property manager manages the property, collects rent, etc., whereas a statutory agent merely receives notices and legal service of process on behalf of the owner. The landlord's in-state statutory agent must be registered with the county assessor for the county in which the rental property is located. If an out-of-state owner/landlord fails to have a statutory agent, the owner/landlord is subject to substantial statutory fines. relevant facts, otherwise the owner (whether they live in-state or out-of-state) may need to personally appear in court to give testimony. If you are an out-of-state landlord and need an in-state statutory agent: Click here.